Sir Cowasjee Jehangir K.C.S.I. of Bombay. bl.uk > Online Gallery Home	> Online exhibitions	> Asia, Pacific and Africa Collections	> Sir Cowasjee Jehangir K.C.S.I. of Bombay. 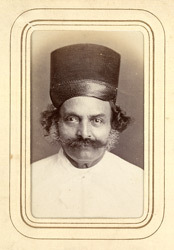 Portrait of Sir Cowasji Jehangir Readymoney (1812-1878), the Parsi merchant and philanthropist, from the 'Album of cartes de visite portraits of Indian rulers and notables' by Bourne and Shepherd, early 1870s. Cowasji Jehangir started his career at the age of 15 as a warehouse clerk for the firm of Duncan, Gibb & Co. in Mumbai. By 1837 he had been promoted to the position of ‘guarantee broker’ to two of the leading European firms of the city and in 1846 began trading on his own account. He was made a J.P. for Mumbai, was a member of the board of conservancy and in 1866 was appointed a commissioner of income tax. In 1871 he was made a C.S.I and in 1872 he was created a Knight Batchelor of the UK. During his lifetime he donated a large amount of money to institutions in Mumbai.